Since 1983 Jenny Craig weight loss programs have helped thousands of Australian women and men reach and maintain their target weight. Dieting success is far more likely when supported by an internationally acclaimed weight loss leader where nutrition, mindful eating and lifestyle improvements are combined for long-term results. How do weight loss meal plans work? How much weight can I expect to lose on a weight loss program? How does a Jenny Craig Consultant keep you on track? Why is losing weight so easy with Jenny Craig? What variety of foodsare inlcuded in the Jenny Craig menu? Are Jenny Craig meals easy to prepare? How can Jenny Craig help me lose my post pregnancy weight gain? How can Jenny Craig help me lose weight in the lead up to my wedding day? How can losing weight with Jenny Craig improve your health? How can knowing your healthy BMI assist with your weight loss journey? What is different about the Jenny Craig program? Why has Jenny Craig been so successful for so many people? At Jenny Craig, we focus on individual needs rather than a one-size-fits-all solution. Your weight loss journey is supported every step of the way by your own dedicated Jenny Craig Consultant, along with the input of professional dietitians, nutritionists and chefs. We take the stress out of weight loss, enabling you to continue with your regular activities without missing a beat, and getting started couldn’t be easier. Your weight loss journey can begin today with only a few simple steps. Your individual weight loss program is tailored according to your personal statistics that include age, weight, health, gender, body mass index (BMI) and more. With Jenny Craig, you can slim down while still enjoying tasty, guilt-free Jenny Craig meals and treats every day. Enjoy Shortbread from the Jenny Craig menu, pictured above. See the full menu. This is where your Jenny Craig weight loss journey really kicks into gear, and it couldn’t be easier to get started. Here’s how you can begin. Step One: Have a chat with a Jenny Craig Consultant over the phone or visit your local Jenny Craig Centre. Your Consultant will work with you to create a personalised weight loss strategy, including your exciting menu plan. Step Two: Enjoy delicious meals specially designed for you using ideal portion and kilojoule / calorie control. Appreciate steady weight loss, improved energy levels, mental clarity and emotional wellbeing. Meals can be conveniently delivered to your door or picked up from your Jenny Craig Centre. Step Three: Check in weekly with your Consultant for advice and inspiration to overcome challenges and reach your goals. Take the opportunity to refresh your menu choices and remember to celebrate achievements along the way. With a little determination your diet plan will reap inspiring results. Jenny Craig will even assist you when transitioning from your weight loss diet to self-sustained independent meal preparation. At Jenny Craig, you can choose to lose as much weight as you like to achieve desired results. Our weight loss programs are personally designed for steady weight loss without unwanted food cravings or irritability. We take the guesswork out of weight loss, and the results will be appreciated every week when you step on the scales. In addition to our famous diet programs, Jenny Craig introduces customers to, Rapid Results, that leverages progressive science involving your body clock’s circadian rhythm. In the Rapid Results Program, kilojoules are loaded earlier in the day, facilitating 12 hours of nourishment (eating) and 12 hours of rest (rejuvenation). Rapid Results is incorporated into our traditional weight loss programs, and customers can expect to lose up to 5kg in the first 4 weeks#. Jenny Craig clients can lose 3 times more weight than a person dieting without professional guidance1. Our dedicated Consultants are a major reason for the outstanding results, and are chosen for their enthusiasm and dedication to help you succeed. Many of our Consultants are former Jenny Craig weight loss clients who want to share successful diet and weight loss strategies with you. Your Jenny Craig Consultant will keep you motivated by introducing you to wide-ranging weight loss strategies. We understand that life doesn’t stand still while dieting, so your Consultant can guide you through solutions to overcome dieting difficulties at home, at work, or while you are out and about. Your Consultant offers holistic lifestyle solutions that will improve your physical capabilities, while the delicious menu offerings will have you looking and feeling good inside and out. The success rate of Jenny Craig weight loss customers is the major reason for our popularity. Weight loss is much easier when backed by an expert and knowledgeable support crew, and Jenny Craig programs tick all the right boxes. We utilise progressive medical science, the input of recognised weight loss experts, and unbeatable healthy meal and snack choices to keep your taste buds extremely satisfied. With a Jenny Craig weight loss program, your family and friends aren’t inconvenienced, and we even make allowance for the occasional visit to your favourite restaurant. Finding the right balance is the key to successful weight loss, but knowing where to begin is almost impossible when unhealthy eating habits have spiralled out of control. The Jenny Craig alternative offers peace of mind in knowing that your weight loss is personally guided, allowing you to stay on track without unnecessary struggles or dieting guesswork. The Jenny Craig weight loss program provides education, strategic direction, dedicated support and guidance to successfully lose the weight and keep it off for life. What variety of foods are included in the Jenny Craig menu? This is where things get really exciting. 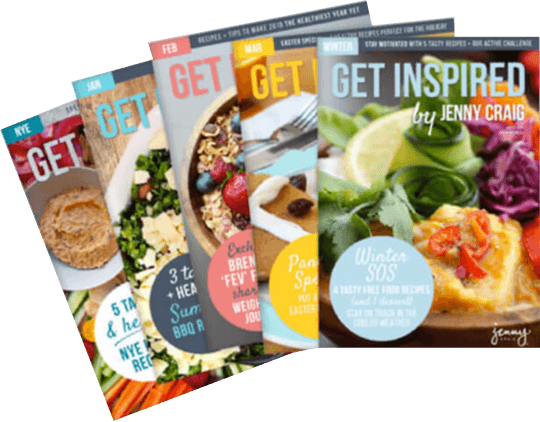 Did you know you can enjoy up to 6 meals and snacks every day with the Jenny Craig menu? The menu options are representative of the best local and international cuisines, and you have the option to refresh your menu choices at any time with the assistance of your Jenny Craig Consultant. Here are just a few mouth-watering menu options to get you started. Weight loss with Jenny Craig is convenient, although it’s a team effort and you will need to maintain focus and determination. Fortunately, we don’t expect you to turn your life upside down. In fact, with so many delicious Jenny Craig menu options to choose from, your dining choices are dramatically expanded. We know many diets claim the benefits and value of superfoods that are nutritionally enhanced for sustainability during weight loss, however, these claims are often unproven. Instead, we prioritise healthy weight loss over dramatic weight reduction popular with transient fad diets, and we allow you to enjoy all your favourite foods even while dieting. When meals are portion and kilojoule/calorie controlled you are in safe hands, and the occasional celebration or night out with family and friends is all part of the journey. There is no denying that dieting and weight loss can be a frightening proposition. The stress is magnified for those who try independent dieting and cooking without Jenny Craig support. Having your meals pre-prepared can relieve some of the pressure, leaving you to simply enjoy the attractive and tasty menu choices. You might even inspire others to follow in your footsteps when they see the delicious options you can choose from. how can Jenny Craig help me lose my post-pregnancy weight gain? Some women are fortunate to bounce back to their pre-pregnancy weight with little effort, but this might not be the case for everyone. It’s also worth understanding that your body will change during pregnancy, but that shouldn’t stop you feeling as good as you can. After pregnancy and childbirth, weight loss strategies need to be carefully considered so they can benefit both you and your baby. Post pregnancy weight loss shouldn’t be commenced until the mother’s body has recovered from childbirth, usually at least 6 weeks after giving birth. Once you get the all clear from your doctor, contact Jenny Craig for the next exciting step in your journey. Incremental weight loss of only half a kilogram per week will quickly add up to around 12kg or more in 6 months, without undue stress for mother or baby. Jenny Craig is the safe, successful way to lose weight the right way. Enjoy Mexican-style Slow Cooked Pork for dinner from the Jenny Craig menu, pictured above. See the full menu. Everyone wants to look their best on their wedding day. All eyes are on the bride and groom, so it’s natural to want to shine on your special occasion. Your upcoming wedding could be just the incentive you need to begin a Jenny Craig weight loss journey, but don’t wait until the last minute. For best results, it’s advisable to commence weight loss at least 6 months prior to your wedding. It takes a lot of effort and teamwork to pull off a perfect wedding. The endless details can be overwhelming, and stress is part of the deal, but with Jenny Craig on your side you will have increased energy, more free time away from meal prepping and feel your best on your big day. Give Jenny Craig a call and get started on your wedding weight loss transformation today. The health benefits of weight loss are undeniable. In most cases, weight gain is due to poor eating and lifestyle choices over many years, and reversing the trend is essential if you want to recapture more youthful vigour and reduce the health impacts. As soon as you begin losing weight you will begin to realise improved health and motivation, and weight loss can reduce your risk of serious ailments and diseases. If you are uncertain regarding a medical condition, consult with your doctor prior to commencing weight loss. Here are just a few health benefits of weight loss. Your Jenny Craig weight loss plan can be of a short or long duration – the sooner you start – the better. Body Mass Index (BMI) provides great insight into the amount of fat you can lose during healthy dieting. Bathroom scales provide limited guidance based solely on weight, whereas BMI takes both weight and height into consideration. Jenny Craig provides helpful resources including our own BMI calculator, and it’s extremely easy to use. Simply input your weight and height into the calculator and you will receive your personal BMI score. Once you have a BMI score you can refer to the BMI chart and continue weight loss with confidence. Achieving a healthy BMI is for people who want to lose weight and stay in shape, and keeping tabs on your progress is easy when referring to your BMI score, represented as follows. For the past 35 years, Jenny Craig has been Australia’s favourite weight loss provider. We continue to evolve, using state of the art technology and progressive science to support our personalised service. Here are just a few reasons Jenny Craig is different from transient food fads, radical fasting and unsupported dieting routines. Jenny Craig treats every client as an individual with personal weight loss expectations. You can continue all regular home, work and social activities while on a Jenny Craig weight loss program as our meals are sustaining and energising. In other words, all you need to do is enjoy delicious meals that have been tailored just for you. If you have previously tried unsupported dieting you will appreciate the difference Jenny Craig makes, as there is no need to eat bland, tasteless or uninspiring food just to convince yourself and others you are trying to lose weight. The easiest way to give up unwanted habits is to accept something better, and replacing unhealthy, fattening foods with healthy alternatives is a Jenny Craig masterstroke that can’t be emulated. Jenny Craig’s success is built on the satisfaction of our weight loss clients, and when your journey is fully supported from commencement until completion, superior Jenny Craig weight loss results can be fully appreciated now and into the future.